Details big and small make Rebel Hill Guest Ranch an unforgettable destination. Rebel Hill Guest Ranch was named for a winning stud horse, Rebel Bean, who belonged to Becky Franks’ family. 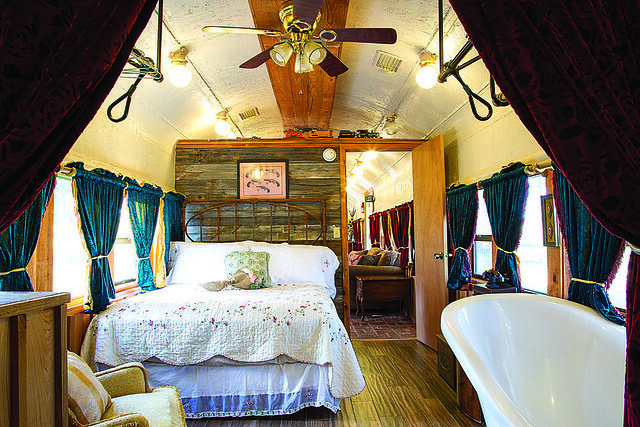 Waking up in a refurbished 1911 passenger rail car on a guest ranch with a view of quarter horses drinking from a nearby pond might be a once-in-a-lifetime experience. But a return trip to Rebel Hill Guest Ranch likely will become a priority for many guests. This third-generation working horse ranch in Antlers started hosting guests more than two decades ago. Justin Kimbrough of Oklahoma City visits Rebel Hill twice a year with his family. “We’re away from the hustle of city life and we’re just doing everything at our own pace,” he says. The Kimbroughs enjoy fishing, swimming, and, of course, horseback riding at the ranch. But the seventy or so horses aren’t the only animals at Rebel Hill. Watusi cattle, llamas, alpacas, donkeys, elk, fallow deer, and even a zedonk—a zebra-donkey hybrid—live here. Another animal attraction, while far from wild, just might be a child’s favorite part of the trip: the six rescue dogs free to roam among Rebel Hill’s cabins. “A lot of kids don’t have dogs at home, so they enjoy having a dog for the weekend,” says owner Becky Franks. Franks’ “cabin dogs” have quite a bit of land to cover. Each of the seven cabins is stocked with pots, pans, utensils, and appliances, as well as towels and bedding, which are not always included in rustic rentals. The most striking cabin isn’t a cabin at all but an eighty-foot passenger rail car that once was a restaurant before Franks bought and refurbished it around 2002. The spacious car has a living room, dining table, a kitchen with an antique stove, two bedrooms, and two bathrooms. The velvet curtains and furnishings with a Victorian vibe—such as a claw-foot tub—are an incongruous luxury. Regardless of what brings them, guests arrive from far and wide. Franks has hosted people from Germany, China, South Africa, Belize, and Honduras, and they all react in a similar way. Rebel Hill Guest Ranch, 420 175 East 1930 Road, (580) 271-0061 or rebelhillguestranch.com.